Form is a fabulous new synth for sound designers and experimentalists. Form's Motion system is brilliant...as is its modulation setup. Sounds phenomenal. Sample range and Motion Curve Editor controls can't be modulated. 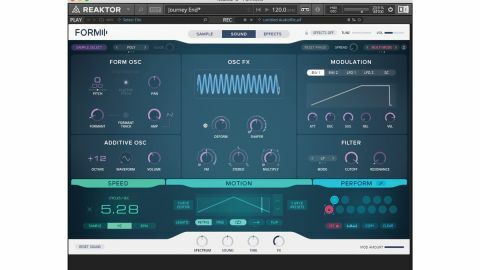 Included with Komplete 11 and Komplete 11 Ultimate (and available separately), Form is Native Instruments' new "sample-tracking synthesizer". Loading in Reaktor 6 or the free Reaktor Player, its core concept is very straightforward: load a sample, either from the sizeable bundled library or your own collection, then select a range within it to serve as an 'oscillator', and design a path for the constant movement of the playhead through that range. Deep but accessible oscillator and effects processing, and a comprehensive modulation setup bring the spice. The main panel of the interface flips between three tabs - Sample, Sound and Effects - with the Speed, Motion and Perform sections, and four preset-specific macro knobs below being omnipresent. The base speed of the playhead is set in the Speed section as a multiple of the original speed of the sample or project tempo, or in Hz, all three ranging from 0.01 to 16. The Motion section is Form's headline feature, where the progression path of the playhead through the sample upon note input is edited in exquisite detail. You can load a preset Curve from the onboard selection or design your own in the Curve Editor, where as many curve segments as you need are strung together to create a flowing sequence. Each segment holds one of five single curve shapes or three repeating ones - the number of repeats is user-adjustable via the Frequency control, and they can be snapped to grid. Segments can be added, deleted, merged, split, copied and pasted, and are resized by dragging their left and right edges. The level, stereo positioning and attack time of each segment are all editable, and the range of a segment's motion within the sample is constrained by dragging the top and bottom handles. The Motion Curve can run forwards, backwards, or forwards then backwards, looped or one-shot, with a Legato mode for preventing retriggering with overlapping notes. Using the Motion controls, even a very short sample can be turned into an endlessly extended sonic adventure with as much temporal variation as you can find the time to design. The Motion curve can also be used as a modulation source, interestingly. The Sample Page shows the waveform of the loaded sample, and the range to be used as the Form Oscillator wave is marked out by dragging its two handles left and right. Activating the Pitch Curve button reveals an overlay showing the pitch progression of the sample, for reference purposes, although it's also available as a modulation source. The Sound page is where Form's two oscillators and filter are tweaked, and modulation is applied. The Form Oscillator (hosting the sample) offers control of Amp (level), Pitch, Pan and Formant, while the bolstering Additive Oscillator (a sub oscillator tracking the Form Oscillator from two octaves below to ten octaves above) outputs a constantly variable waveform, sweepable from sine to soft square via soft saw. A variety of processing options for the Form Oscillator are on hand in the Oscillator FX section, comprising FM (using the Additive Oscillator as the FM source), waveshaping, stereo 'jitter', distortion and harmonic multiplication. The Filter is a simple resonant affair featuring Low-Pass, High-Pass and Notch types. - are assigned by clicking the name of the target parameter (each of which can accept three sources) and selecting from the pop-up panel that appears. It's as intuitive a system as we've ever seen, and with the modulation of each control visualised by an animated white marker, it's always easy to keep up with what's happening movement-wise. Last but not least, the Effects page houses compressor, overdrive, reverb and delay modules, plus the rather novel Frequency Shaping module - a pair of graphically editable band-pass filters. Form is a lot like a wavetable synth in the way it scans through samples, but with a more 'contiguous' approach. It's an instrument for those who enjoy sonic exploration, rather than those seeking instant results - although there are some fine basses and leads presets, its clear speciality is intricate soundscapes, evolving pads, spacey textures and burbling, skittish electronica in general.A beautiful thing, Form is something we'd put up there with that other Reaktor-based classic, Razor.